So chocolatey and peanut buttery, these peanut butter and chocolate stuffed cookie sandwiches are sure to wow your chocolate-loving mom for Mother’s Day! Ohhhh, are these cookies something today! My mom is a big chocolate lover. Pretty sure she eats it as a meal. It is no surprise that I love it, too, and I have carried on that genetic to my daughter. When I began thinking about Mother’s Day recipes I knew at least one recipe had to revolve around chocolate. Today’s peanut butter and chocolate stuffed cookie sandwiches fit that bill in soooo many ways. Chocolate. Peanut butter. Chocolate and peanut butter cookies with chocolate peanut butter spread squeezed between them… Yeah, life cannot get any better! The secret here is to place your Reese's spread accordingly so the two cookies will stick together! Cream together the butter and sugar in your stand mixer for 5 minutes. Add peanut butter, melted chocolate, and mix for another 2 minutes. Beat in egg fully, followed by vanilla. Sift together the flour, baking powder, baking soda, and cocoa. Pour into butter mixture and mix until just combined. Measure out 1 tbsp. sized portions using a cookie scoop. Add 12 balls to a pan. Bake for 10-12 minutes. Allow to cool slightly on tray before moving to wire rack. Cool completely. Take one cookie and spoon some Reese's spread on (trying to make it higher in the middle.) Add some Reese's peanut butter cup pieces around the edges and sandwich together with another cookie. Those chunks of Reese's are calling my name in these cookie sandwiches! I have a slight crush on Reese's! I just made brownies and figured why not add some to the mix. It's a problem, or maybe not? These look so good! Sometimes I think it is a problem... And then I realize just how amazing Reese's are! These cookies leap off the page I wish I could just grab it and try it out. They look so good. Can you believe that I haven't tried that spread yet? 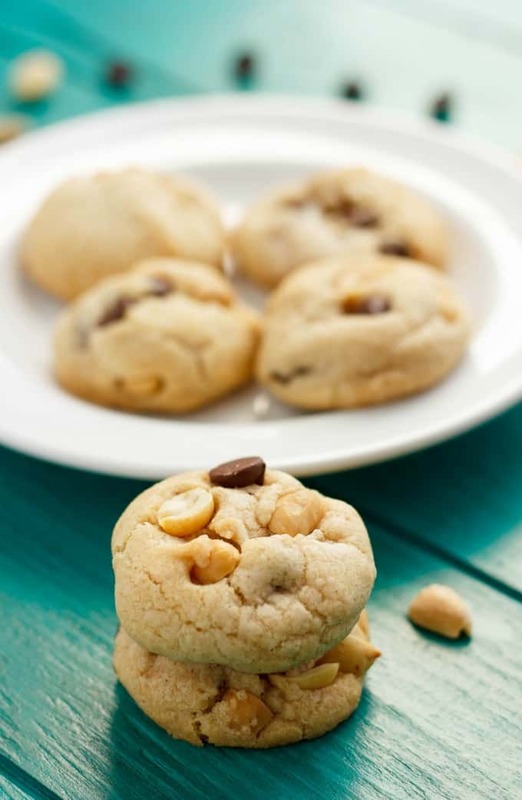 I need to get on that...and then I need to make these bad boys because I cannot resist the pb/chocolate combo! Chocolate cookies are a favorite with my kids! They would love these! Seriously, my DREAM cookie. These look fantastic! How do I stop at just a couple of these?!? Perfect cookies with perfect flavors!